So, you broke your foot…now what!?! Here is my post injury workout log. Every injury comes with different limitations but hopefully this will give you some good ideas. Again, take what works for you, leave the rest, and listen to your body! AMRAP 20min of: 250m row, 15 seated overhead press (45lb barbel), 25 sit-ups. I’ve progressed to double leg row with most of the pressure on the non-injured leg and injured leg with boot not strapped in. 10, 9, 8….1 single leg burpee pull-ups, 10, 11, 12….20 wall ball sit-ups (14lb med ball) THEN reverse 1, 2, 3….10 single leg burpee pull-ups, 20, 19, 18…10 wall ball sit-ups. This was tough and I even did my pull-ups to a bar I can just reach. Halfway through the Ida Maria song “Oh My God” came on my playlist and I think that pretty much summed it up! 90sec work, 90 sec rest of AMRAP: 5 pull-ups, 5 seated power cleans 65lb, 5 one leg burpees. Start the 90sec work with the pull-ups each time. With a partner, alternate 250m row and the following: pushups, wall ball sit-ups 14lb ball, seated dumbbell power clean 25lb, knees 2 elbows, and ring rows. While person A rows, person B completes the exercise until person A is done rowing, etc. Special thanks to Carlys who made my Saturday by doing this WOD with me! Happy Birthday WOD “Fun 31”: Row 3100m, 31 wall ball sit-ups (14lb med ball), 31 box step ups (20in box), 31 seated dumbbell clean and jerk (20lb), 31 pull-ups, 62 sit-ups, 31 seated dumbbell swing (25lb), 31 seated dumbbell rowers (20lb). Partner WOD: AFAP 6 rounds of 10 wall ball sit-ups (20lb med ball), 10 elevated pushups, 10 pull-ups, 31 sec L sit—wheelbarrow carry your partner between each exercise! Did this as a large group with partners….SO fun! 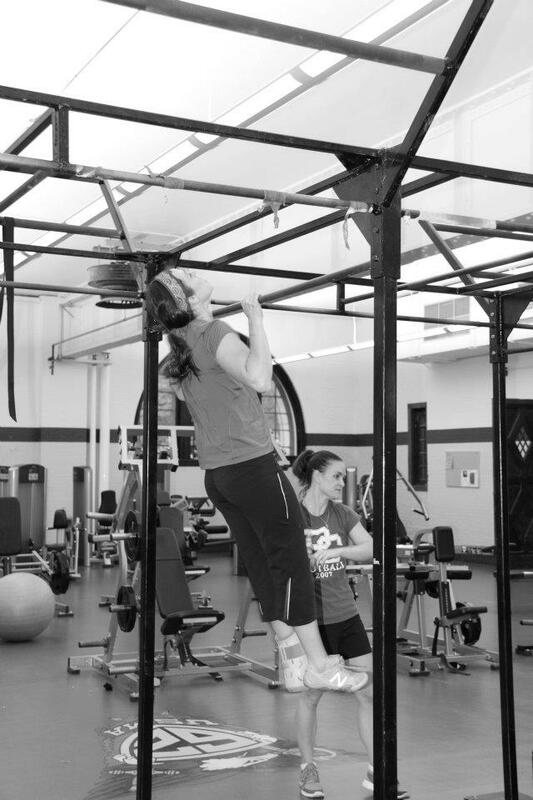 Death by pull-ups: On the minute, every minute until you max out. Minute one do one pull-up, minute two do two pull-ups, and so on. Only made it to 8 today! 5 RFT: 20 wall ball sit-ups (14lb med ball), 20 pike press pushups, 20 1-legged hip bridge each side. Got my boot off Friday. No running, jumping or walking up hill for 2 more weeks but able to slowly incorporate some lower body! Felt like torturing myself with “hamburguesa” today to celebrate: 5 pullups, 10 single leg pushups, 15 air squats, 300m row, 21 kettle bell swings (KBS) 35lb, 12 pullups, 500m row, 75 wall balls (14lb ball), 500m row, 21 KBS, 12 pullups, 300m row, 15 air squats, 10 single leg pushups, 5 pullups. Overall it felt great. The only time I felt any pain was when my form faulted. I could feel if my weight shifted even slightly off my heels. What a great reminder that functional movements done with proper form are so good for your body, perhaps even healing! The next morning my quads were burning in a good way after being neglected for 3 weeks! AMRAP in 20 minutes of: 3 wall climbs, 10 down ups (without the jumping part! ), 5 paralette pass throughs, 10 grasshoppers. WOD demo here. WOD for Warriors with our amazing pursuing prime fitness ladies! We all subbed piggyback squats for fireman carry squats. I subbed burpee box step-ups for the burpee box jumps. The only P90X DVD I still use….YOGA X. Much needed after the WOD for Warriors! 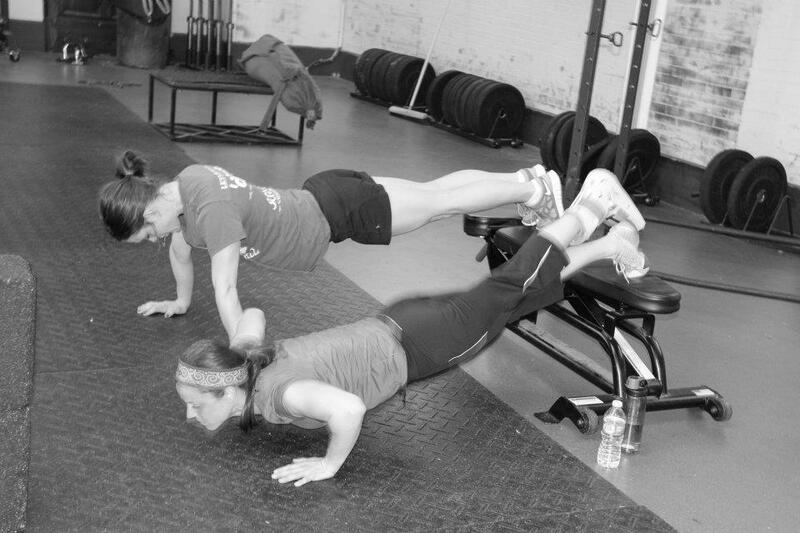 For time: 10, 9, 8….bodyweight deadlift coupled with 10, 11, 12….elevated pike pushup. Felt really good to get back on the barbell! Rowing Michael: 3 rounds of row 1000m, 50 GHD sit-ups, 50 GHD back extensions. Here ends my post-injury workout log. I am back to doing mostly regular WODs minus any jumping, running, and explosive movements, which I will slowly incorporate over the next few weeks. I hope this remains a great tool/starting point for anyone who needs it! Thank you! I’ve Crossfitting for about a year and recently re-injured my foot. Thank you for posting some of your WODs! I’m going back to the gym tomorrow to start tackling them! So scared to re-injur the broken bone. Hope two weeks enough to start! Thanks for taking the time to share these. I unfortunately have a lisfranc dislocation and need surgery this Monday. I am so depressed as I am an avid crossfiter and have made tremendous gains and am in the best shape of my life. I plan on using tees through my recovery and appreciate you posting these to use. Thanks and best of luck in your recovery! These are great! Just found out I have a fracture in the ball of my foot – so I’m looking forward to trying all of your suggestions w/ my new BOOT. (Ugh!) Question – did you experience any decline in your fitness level (or dreaded weight gain) during the period when you were injured and having to modify your workouts? Thank you for posting these modifications. I recently got tendonitis in my foot and I did feel like being broken was going to break me down… mentally and physically. These WODs will def help. Thanks again! Thank you for posting these. I am recovering from a stress fracture. It’s been SO depressing not being able to feel like I’m getting a good workout in, and I miss lifting! My coaches at the gym have not been willing/ able to help me. Ridiculous! So I’m going to try these on my own starting today! I just came across this and it’s wonderful! It gives me hope because I’ve been starting to feel depressed and limited in what I can do for myself. I’m extremely active and I broke my 5th metatarsal in the shaft about a week and a half ago. I do have some questions, what was your injury? How long before you were able to start working out? How long did you have to wait before putting weight on it?